With music taking centre stage in many recent major television series such as LOST, HUMAN TARGET and 24 it almost comes as a surprise when the score takes a backseat and allows the drama onscreen to carry the weight. Shows such as the aforementioned three are universally known for their enigmatic, adventurous and intense themes, making their analysis somewhat easier than RICHARD MARVIN’S work for IN TREATMENT. With the exclusion of AVI BELLELI’S title theme music from the score, it becomes difficult to identify any overarching theme for the series. While “Jake & Amy (theme) – Week 1 – Season 1” (4) and “Sophie – Week 2 – Season 1” (2) are used during the credits, the tracks consist of ideas found only sparsely elsewhere. 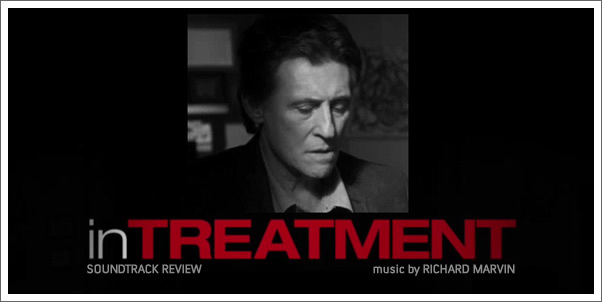 With most episodes detailing the sessions of a different patient, the only identifiable consistencies in theme or instrumentation come when a particular patient is granted multiple tracks across the soundtrack. For example Gina, a character with 6 tracks in the score release. “Gina – Week 5 – Season 1” (7) and ”Gina – Week 1 – Season 1” (16) mirror one another in instrumentation and their pensive tone, but it’s there that the similarities come to an end. No theme becomes apparent, just mood and timbre.